If you got charged with DUI or criminal charges in Davie, first of all, don’t panic. Don’t even get upset. This is not the end of the world. Contact us immediately to get represented by a Fort Myers DUI attorney. You can fight back hiring a DUI attorney in Fort Myers. Click Here to contact us online or call us at 1(800) 999-6999 (or use the local number above) today to get represented on your Florida DUI charge. If you got criminal charges for battery, felony, drug possession or domestic violence, contact us to get represented by a criminal attorney in Fort Myers. It takes a professional to navigate the system and prove your case in court. We are confident that we may be able to help you fight the charge and come out ahead. An experience criminal lawyer in Ft. Myers will attempt to present your case in the best possible light for you. We believe that most cases can be won, whether it be on technicalities, or simply the facts. FIGHT YOUR FLORIDA DUI CHARGE! For just a second, put aside the notion that you can’t fight city hall. The fact is, you can fight, and you should! It’s your right to explore every possible angle to avoid the costly consequences of getting a DUI in Florida . Whether you have a squeaky clean driving record or some prior traffic offenses, you should do everything you can to avoid having points added to your license. Others do, and you should too. HIRE A DUI ATTORNEY IN FORT MYERS TO REPRESENT YOU! Hiring a local attorney is important. Knowing the people involved and the area where the Florida DUI was issued can make a big difference. While this may be a first DUI or arrest for you, our DUI attorneys in Fort Myers have been down this road many times. This is familiar territory for them, and the right one may be able to guide you through the system to ensure the best possible outcome. We have 22 offices, 14 full-time, local attorneys. We have extended office hours and our phones are answered 24/7 by an employee, not an answering service. You wouldn’t go to court to fight a major crime without a lawyer, so why would you consider fighting a Florida DUI charge on your own? It takes a professional to navigate the system and prove your case in court. 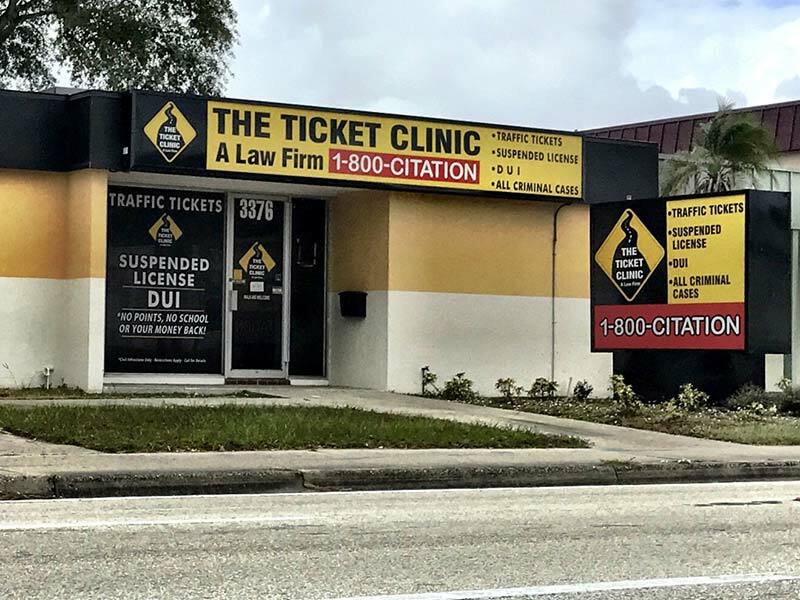 That’s all we do at The Ticket Clinic, a law firm – fight traffic offenses and DUIs. We are confident that we may be able to help you fight the charge and come out ahead. We will attempt to present your case in the best possible light for you. We believe that most cases can be won, whether it be on technicalities, or simply the facts. We’ll look for every possible way to get your fine reduced or your Florida DUI dismissed. We’ve resolved more than 1 million cases since 1987. We may be able to do it for you too.